Der Artikel Glenn Gould Remastered - The Complete Columbia Album Collection (USB-Stick) wurde in den Warenkorb gelegt. 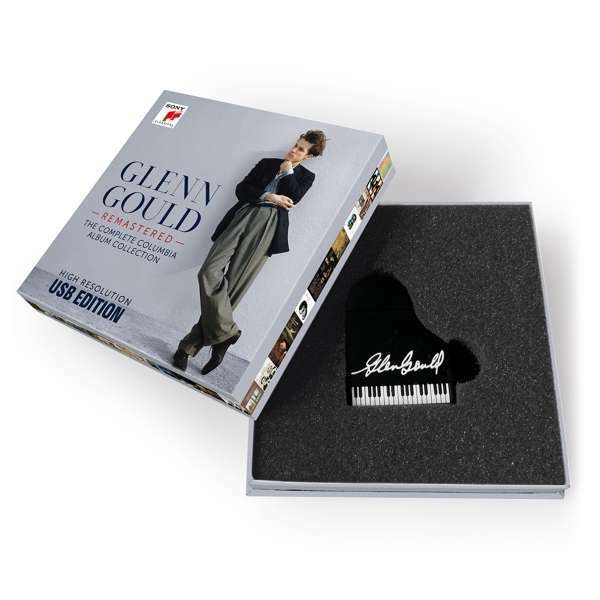 Glenn Gould Remastered – The Complete Album Collection – USB Edition refurbishes Gould’s complete approved studio recordings using state-of-the-art Direct Stream Digital (DSD) technology in a 78 albums limited USB-edition. The 404 page digital book includes complete original liner notes (many penned by Gould himself) and a newly commissioned introductory essay by Gould scholar and biographer Kevin Bazzana. In 1955 Glenn Gould signed his exclusive contract with Columbia Masterworks, and remained with the label until his untimely death in 1982. Gould’s first release, Bach’s Goldberg Variations, released in January 1956, took the music world by storm, and immediately established the 22-year-old Canadian pianist as one of the most brilliant, original, charismatic and provocative classical performers of his time. Born in Toronto on September 25, 1932, Gould studied at first with his mother, and subsequently with Alberto Guerrero at the Toronto Conservatory of Music. He began performing concerts as a teenager, while his first CBC radio recital in 1950 launched his “love affair with the microphone”. By his late teens Gould’s artistic persona was fully formed. Right at the start he favoured unusual programs, with Bach, Byrd, Gibbons, Sweelinck, Haydn and Beethoven on one side, Schoenberg, Berg, Webern and Hindemith on the other, broaching the Romantics selectively. In 1957 Gould became the first North American to perform in the Soviet Union since World War II. After less than a decade of international concertizing, Gould retired from the stage at 31 in 1964 to focus on recording, television work, creating innovative radio documentaries, and writing articles and essays. Few pianists are so easily identifiable as Gould, whose rhythmic acuity, breathtakingly clean articulation, and scintillating technical aplomb still leave a formidable individual imprint, from his brashly controversial Mozart Sonata cycle and spacious Brahms Intermezzi to his fiercely committed 20th-century music interpretations and, of course, his bracing, joyous and highly influential Bach. Zur künstlerischen Qualität der Aufnahmen von Glenn Gould ist ja bereits alles gesagt worden. Ich möchte mich in meinem Kommentar auf das neue Medium USB Stick beschränken. 1. Mehrere bis viele Aufnahmen in den Boxen habe ich schon auf Vinyl oder CD oder auf beiden Medien, aber eben immer nur einen Teil. 2. Ich habe schlicht keinen Platz mehr. 3. Im Auto oder im Urlaub (wenn man Zeit hat in Ruhe Musik zu hören) sind die großen Boxen als Mitnahme nicht geeignet. Die Lösung für diese Probleme ist der USB Stick. Darauf können inzwischen riesige Mengen an Musik im hochauflösenden Flac Format (als Zugabe für MP3 Player oder das Smart Phone noch im MP3 Format) gespeichert werden. Ich kann den Stick in jede Tasche stecken und der Transport ist kein Problem. Alle modernen Vorverstärker, CD Player, BR Player, Autoradios, Kompaktanlagen haben heute einen USB Anschluss mit Streamer. Die Tonqualtät der Flac Dateien auf dem Glenn Gould Stick ist excellent und ist mindestens genauso gut wie von der CD, oft sogar besser. Ich wünschte mir für die Zukunft für alle CD Boxen mit mehr als 10 CDs als Alternative den USB Stick. Der Kaufpreis sollte günstiger sein, als der der CD Boxen, ausserdem tut man dann auch noch was die Umwelt.